The cultural mosaic of Pakistan features a diversified potpourri of art, literature, music, customs, tradition and an enormously rich historical heritage. Inhabited by people belonging to various ethnicities and language, the versatile cultural life of the country is a rich mix of different subcultures being represented by the vibrant and passionate individuals who have left their footprint in the cultural heritage. In an endeavor to understand and highlight one of the subcultures in Pakistan, an educational and cultural show titled, “An Evening of Chitral Heritage” was organized by Habib University’s ARZU Center in collaboration with Chitral Heritage and Environment Protection Society (CHEPS) at the campus auditorium for the HU Community. The Arzu Center for Regional Languages and Humanities contributes to Habib University’s vision and institutional mission through fostering pedagogy, research and scholarship in the various languages from Pakistan. Adversely affected by the lack of clearly defined educational and national priorities, this Center is designed to contribute to the revitalization of these languages and cultures. The Center’s scope of work covers a wide range including language instruction, translation from and into the regional languages, development of pedagogical material, cultural and literary preservation and the promotion of language-based activities. The evening showcased short talks by the chairman of CHEPS, the youth director of CHEPS and current Student Council President, Abdul Wahid Khan and other guest speakers who shed light on Chitrali culture, heritage, and environment. Remembering the ones who had left for the heavenly abode after PK-661 plane crash last year, the event started off with prayers for the deceased and their families. This was then followed by the presentation of Chitral’s unique culture and beautiful folk music that has often been ignored country-wide, while having it confused with the Pashto culture. Wahid Khan, student from HU’s Social Development & Policy program at the School of Arts, Humanities and Social Sciences (AHSS), introduced the audience to the distinct and diversified tangible and non-tangible elements of Chitral’s culture comprising of food, rituals, customs and traditions. He further explained about CHEPS and its valuable projects in the areas of environment and heritage. “Around 2000 projects have been successfully executed for the protection, preservation and promotion of a rich heritage and a healthy environment. Moreover, CHEPS also takes pride in treasuring an archive of around 364 documentary films recording life stories of the individuals and more than 500 famous folk tales in its databank,” disclosed Khan while speaking at the occasion. It was also learnt at the event that the cultural spectrum of Chitral has undergone a considerable transformation over the years owing to various reasons and the impact of modernity is one of them. The colors of modernity have deeply affected Chitral’s culture in several ways. According to Commissioner Salam, the cultural mosaic of the city has not only been modified with the addition of diversified values being brought in by the people of Chitral hailing from various corners of the world but the implementation of several projects in the locality by different international NGOs has also played its part in redefining the cultural spectra. Drawing a huge crowd, the one-of-its-kind event also included women’s voice and Kalash representation, both of which have been ignored within Chitrali cultural representation. The evening featured a talk by Professor Kaneez Fatima on the status of women in Chitrali society and how has she been able to contribute towards defining the cultural identity of the community. “The women in Chitral are known to have stood by men in almost every sphere of life, excelling in not only managing their household but also making a contribution towards the economy. Around 49% of Chitral’s population comprises of women, and therefore, it is being called as Auratabad,” she expressed. The second portion of the program, comprising of traditional music being performed by the local young artists Zulfiqar Ali Shah, Irfan Ali Taj and Moaaz Afridi, gave the event its life and vibrancy. The awe-inspiring music coupled with traditional folk dance turned out to be a spectacular cultural treat for the audience. Understanding the necessity of celebrating life and having fun while acknowledging and embracing the diversity in varied spheres of life, Habib University has always been a happening space for events pertaining to different forms of art and culture since its inception. 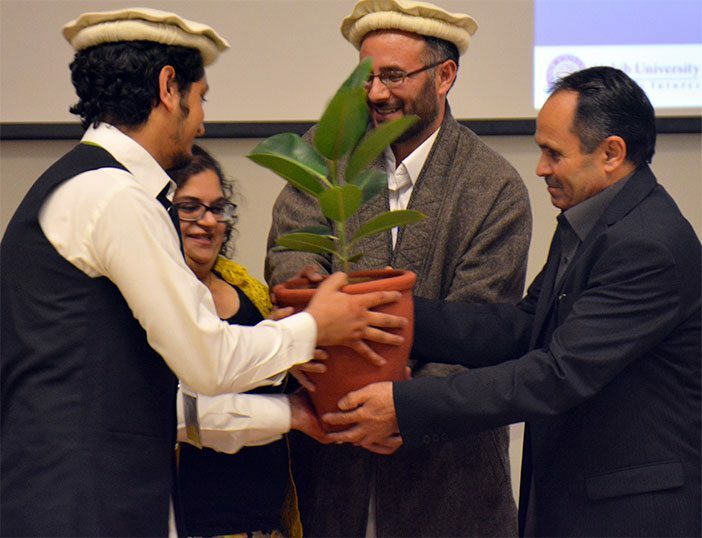 Continuing the journey in the same direction, An Evening of Chitral Heritage was another productive step towards promoting cultural diversity not only at the University but for society as a whole.